Sunday and Monday’s lessons continue spelling out the dangers of being rich and not having the right relationship with one’s wealth. Are we to learn to “Rest in the promise that, somehow, when it’s all over, God’s justice will be done,” (in some mysterious way), or are we supposed to take action to make sure we are not to be counted with the weeping and wailing ones? We must take action now to make sure that our own wealth, however small, is something that the Lord can use to make a difference in lives today. God’s justice will be done because he is God and that is his will; there is no other reason to question God’s justice. Today’s lesson is about the eternal worthlessness of physical wealth. This would be a perfect opportunity to point out Jesus’ teaching on wealth and earthly treasures. Again I tell you, it is easier for a camel to go through the eye of a needle than for a rich person to enter the kingdom of God." Jesus taught a lot about money because money, unlike anything else, can cause a good man to turn to corruption, a giver into a hoarder or a philanthropist into one who gives to questionable charities. What the lesson author fails to do in today’s lesson is to show how ones wealth is to be used if one has it. Good money management skills and giving to one’s brother who may be needy are practices that are based directly on the teachings of Christ. Yet they are not to be confused with the preaching of the gospel. Both the rich man and Lazarus are depicted in the same place (vs. 23)—the grave (hades). The chasm separating them symbolizes the fact that after a person dies, his or her eternal destiny is fixed. 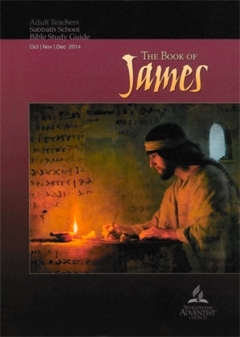 The parable of the Rich man and Lazarus is not to indicate that “The chasm separating them symbolizes the fact that after a person dies, his or her eternal destiny is fixed.” The parable is about the rewards one will receive; some will receive their rewards on earth, while others will receive their rewards in heaven. Heaven and hell is most definitely taught by this parable. Also, it is shown that there is conscious existence after death. Jesus would not use false doctrine to make a point in a parable. The truths the parable teaches are to be taken at their face value, not metaphorically or allegorically. The chasm symbolizes that there will be a separation between the saved and lost throughout eternity. What regretful things have you done that, though you might be able to “make up” for now, you won’t be able to make up for them later? This is akin to making a list of your sins that you can “make up for.” We don’t make up for regretful things we have done, we repent and go on to do good things. We need to receive the forgiveness from God for the way we have handled money in the past and start on a new course of the proper use of this worlds goods that have been entrusted to us. Those who are “rich, and increased with goods” (Rev. 3:17) may be more needy spiritually than they think. God warned Israel to beware lest after they entered the land and became prosperous they should forget that all the good things they enjoyed came from Him, including the “power to get wealth” (Deut. 8:11–18). The blaming of victims for injustices done to them does not have a place in this week’s lesson. It is not an appropriate issue to deal with in light of what this week’s lesson is about. It’s actually a bit strange to find this teaching mixed in with the teaching of how one’s finances are to be used. “When one becomes involved in debt, he is in one of Satan’s nets, which he sets for souls.” Ellen G. White, The Adventist Home, p. 392. Is helping people to get out of debt or to avoid getting into debt a part of “preach[ing] the gospel to the poor”? (Luke 4:18). The preaching of the gospel and one’s financial situation should never be confused. It is one thing to preach that Jesus lived, died on a cross for our sins, was buried and rose again for our eternal life. It is quite another thing to deal with someone’s handling of their personal finances. The poor we will always have with us, as Jesus himself stated. The preaching of the gospel is not to tell good news about how one’s financial situation is to be maintained. We are commanded to preach the gospel of Jesus Christ to the world, to the rich and the poor, slave and free. Christ’s teaching about the use of money is a secondary teaching that should not be the basis for any preaching of the gospel to those who are lost and in need of a savior. There are good materials available to the Christian to deal with one’s finances; these can be found in almost any Christian book store, and would be appropriate to use to help those who have made bad decisions learn how to make good decisions with their money. Make sure to not use or trust the teaching of the so-called “prosperity teachers” who could lead one into financial ruin. Joel Osteen, Benny Hinn, Creflo Dollar, or Kenneth Copeland are not teaching truth when it comes to using one’s finances. Copyright 2014 BibleStudiesForAdventists.com. All rights reserved. Revised December 1, 2014. This website is published by Life Assurance Ministries, Camp Verde, Arizona, USA, the publisher of Proclamation! Magazine. Contact email: BibleStudiesForAdventists@gmail.com.